Love the packaging! 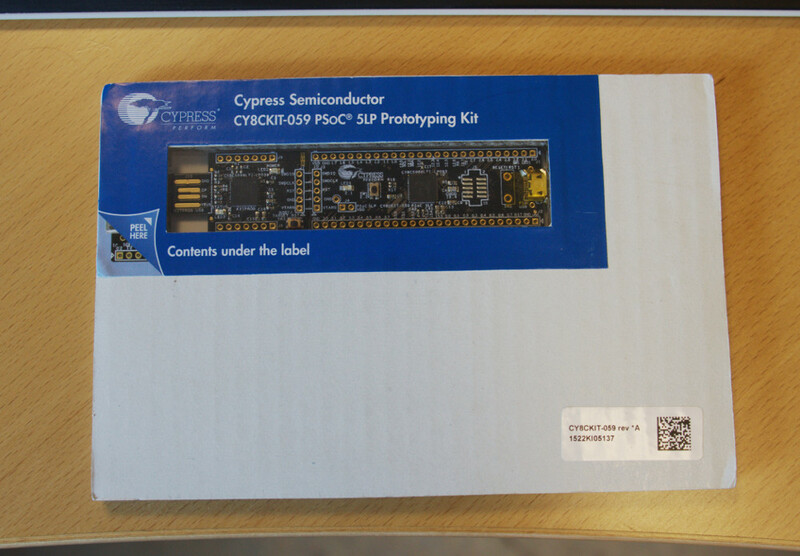 I got this CY8CKIT-059 PSoC 5LP proto kit, and the CY8CKIT-049-42xx, the PSoC 4 proto kit, as they’re both super cheap, and they both came in rather excellent packaging. The pcb is behind a peel off window, in a cutout of a sandwich of three sheets of corrugated cardboard. 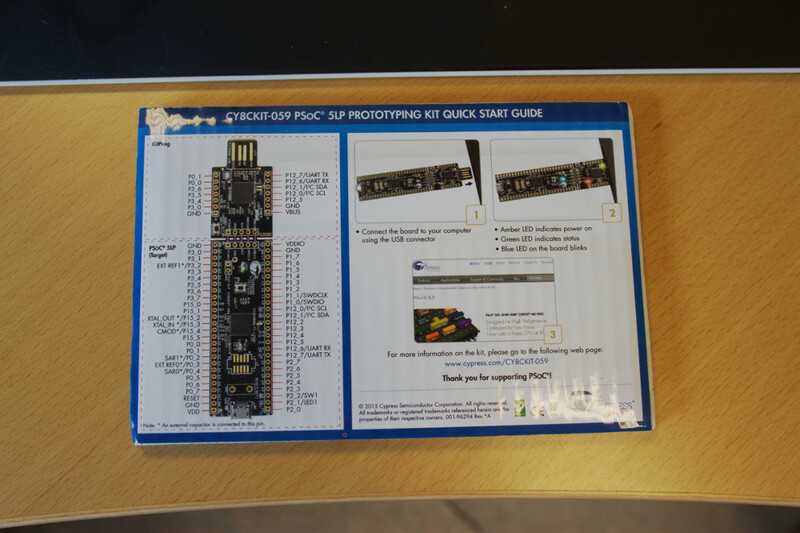 The backside has a nice graphical layout with pins labelled, and some basic info on where to get more info. 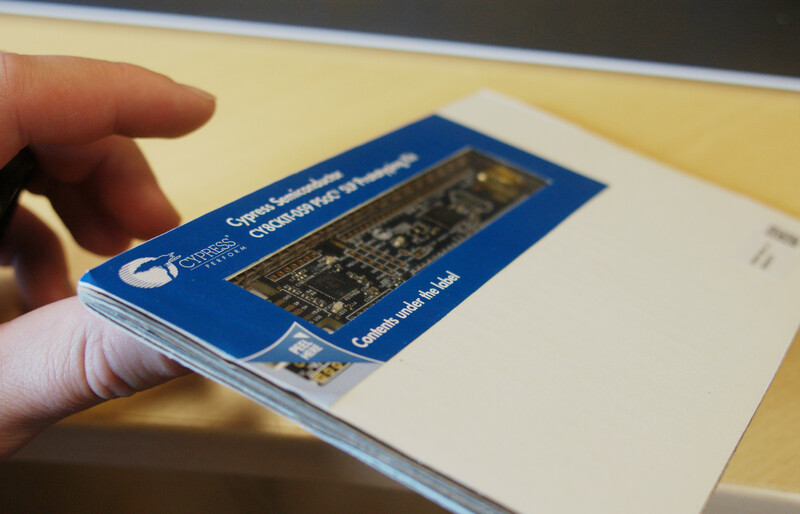 Very nice, compact, easy to ship, well done Cypress. Of course, that’s about all that’s nice. The PSoC family seems interesting, I’ve been wanting to play with them for a while, but Cypress has absolutely zero linux support, and because of the configurable nature of the device, you really do seem to need to use their windows PSoC Creator tool. Allegedly once you’ve designed your system, you can edit the code portions freely, but it seems a long way off. OpenOCD has support for the flash in the PSoC 4 family, but nothing (yet) for the flash, and definitely no support for the KitProg programming dongle. That KitProg does seem like a nice bit of gear in it’s own right though, it’s USB2I2C, USB2UART, SWD debug adapter, on a little snap off portion of the board. However, even the USB2UART portion fails to be recognised as CDC-ACM in linux, presumably due to a bug in the descriptors. lsusb implies that they’re trying to be CDC-ACM. This one will have to be on the shelf for quite a while I’d imagine. Bus 003 Device 011: ID 04b4:f139 Cypress Semiconductor Corp. The KitProg also has a bootloader of some form, if you hold down reset while plugging it in, though it times out and reboots normally after a couple of seconds idle. Bus 003 Device 012: ID 04b4:f13b Cypress Semiconductor Corp.